Meet Calf Hero™ 12, the world’s first intuitive colostrum management system for large herd dairy farms. Each maternity employee can become a Hero with the ability to quickly thaw and feed colostrum to your newborn calves. Download the Calf Hero™ Colostrum Management brochure. Meet Calf Hero™ 6, packed full of the state of the art technology that made the Calf Hero™ 12 so successful, but designed in a more compact package for growing dairy farms. Download the Calf Hero™ Colostrum Management brochure. 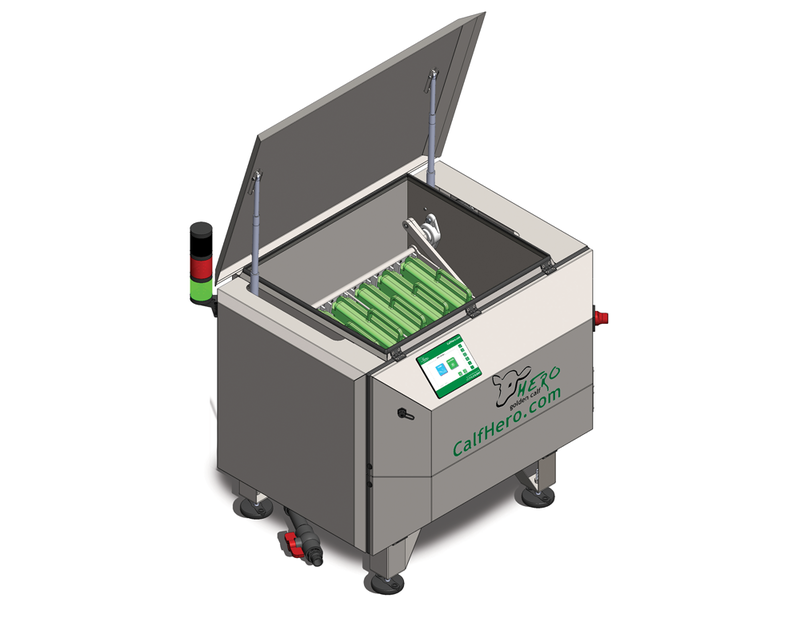 Designed to satisfy the state-of-the-art facilities today and the increasing number of cows per dairy, this colostrum pasteurizer can handle up to 12 one-gallon sized colostrum meals. The dairy industry’s around the clock schedule represents a unique challenge. The Calf Hero 12 stands out with a unique software solution called SmartErrors to ensure continuous uptime. Calf Hero 12’s most noticeable feature is its large 6” touch screen with oversized icons, large letters, and the ability to easily switch between English and Spanish. The user experience simply matches today’s mobile technology. Hot Water Assist System (HWAS) uses hot water already available on dairies. Through an improved design of the Calf Hero 12 holding tank, efficiencies in software, and the ability to use hot water already available on dairies, we reduced the amount of water and energy needed to pasteurize and cool an individual meal of colostrum. Password protected user levels improve process control. Managers gain access to history of the pasteurizer cycles, while a calf feeder’s access is limited to the daily tasks of pasteurizing and thawing. This limits the number of user-caused errors and allows for stricter adherence to the dairy’s colostrum management protocols. Just in time order reminders come via text message to the manager to ensure continuity of supplies without overstocking. Orders can be conveniently placed via the touch screen of the Calf Hero 12. This ordering function is password protected and requires employee’s initials and purchase order number to prevent misuse. University research shows that the optimal time/temperature combination, which protects the Immunoglobulins but removes the highest number of bacteria is 140°F (60°C) for 60 minutes. The Calf Hero 12 uses multiple high precision sensors to assure that the temperature is reached quickly and maintained properly. Rapid cool down at the end of a pasteurizing cycle is critical to protecting colostrum quality. The Calf Hero 12 features a cooling system that takes advantage of the thermal properties of water, naturally accelerating the cool down phase. It is the only colostrum pasteurizer that uses multiple precise temperature sensors for the best results in the industry. Built of parts that were designed to withstand daily dairy operation, it is inclosed in stainless steel for easy maintenance. Each Calf Hero 12 is produced in Wisconsin. Never before could you have a text message sent, not only to one but multiple cell phones, to notify that colostrum is ready, that you are running out of supplies or that there is an error. This unique feature of Calf Hero 12 will improve the quality of the colostrum being stored and fed, as well as ensure that colostrum protocols are being followed properly. Any time a service issue occurs an email/text is sent to the Calf Manager. At the same time a message on the screen informs the on-site user of the problem and of its possible solutions. The SmartErrors function will either walk the user through a simple repair or replacement, or for non-critical errors, simply override them so that the day-to-day operation of the dairy can continue. Every dairy’s goal is to feed their newborn calves colostrum as soon after birth as possible. Our built-in reminder feature will help make that possible. At the end of each cycle whether it is thawing or pasteurizing, a loud audio alarm will also sound in addition to the display notification. A text message is sent and stack lights, which can be mounted outside of calf kitchen to attract attention in the pen, light up.